Machine shops create complex metal parts using thin sheets of similar or dissimilar metals along with diffusion bonding; conformal cooling, heat exchangers, liquid/gas dispensing and other applications benefit. 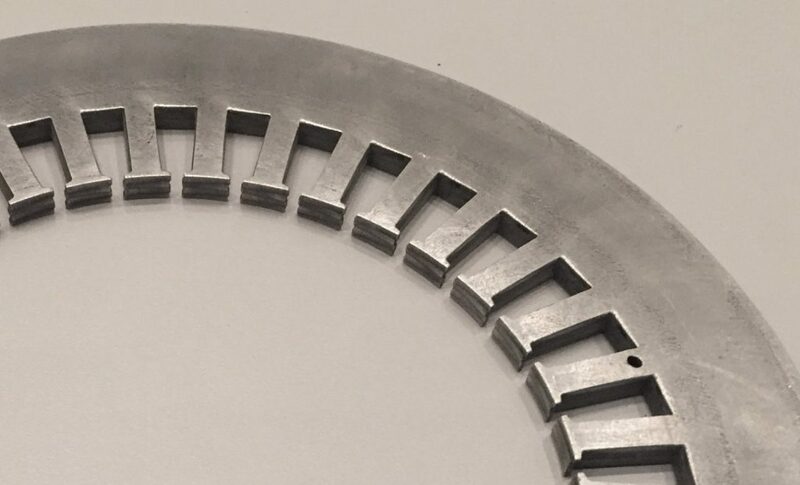 A unique additive manufacturing process is helping precision machine shops to create metal parts with complex internal cooling passageways or channels for dispensing liquids or gas layer by layer before final machining. The additive manufacturing process can be used to build a part from the ground up with thin 1-2 mm sheets of metals and alloys. As with similar techniques, 3D modeling software is used to map out sophisticated internal channels or passageways prior to CO2 laser cutting of each layer. 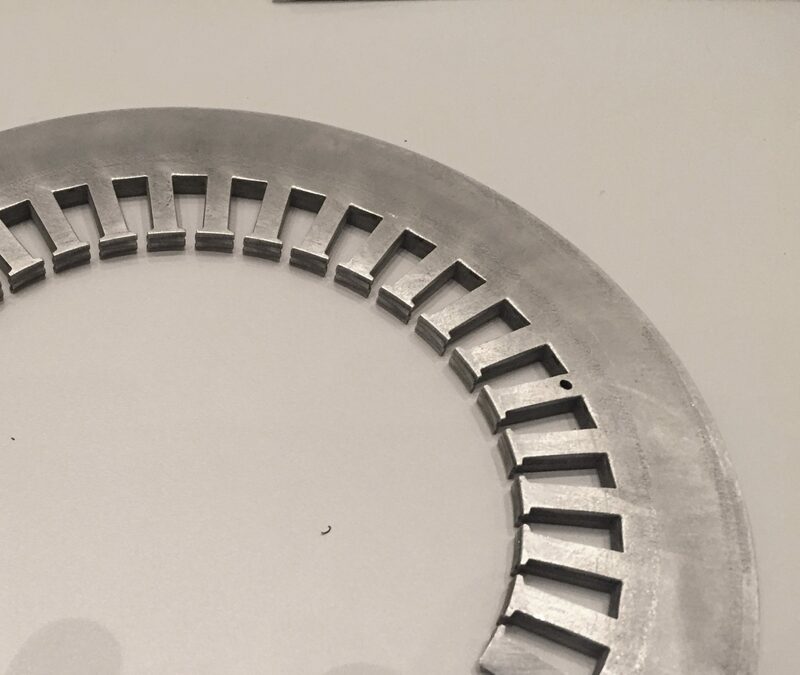 Using this technique, finished parts as large as 900 mm (35.43”) x 1250mm (49.21”) x 500 mm (19.69”) can be constructed from stainless steel, titanium, zirconium, beryllium, high alloyed aluminum, Inconel and tungsten. The process can also be used to weld dissimilar metals like copper to titanium, copper to aluminum, copper to tungsten and even Molybdenum to aluminum. 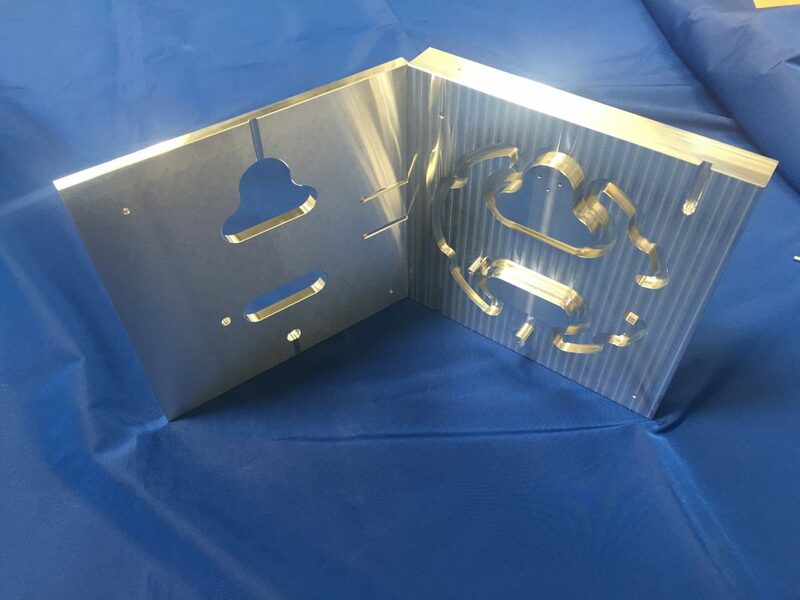 For precision machine shops that serve the medical, aerospace, semiconductor and automotive industries, the technique provides a method to create parts that are difficult, if not impossible, using traditional CNC equipment or less effective brazing/welding techniques. With diffusion bonding, finished parts can be constructed from stainless steel, titanium, zirconium, beryllium, high alloyed aluminum, Inconel and tungsten. For metal parts that require sophisticated internal channel geometries, whether with an inlet and outlet – or neither – there can be many twists and turns. Examples include heat exchange applications, where channels are machined into aluminum to disperse heat by air or liquid cooling. Given that the surface area of the cooling zone is a primary factor in heat transfer, the more extensive the channels, the better. 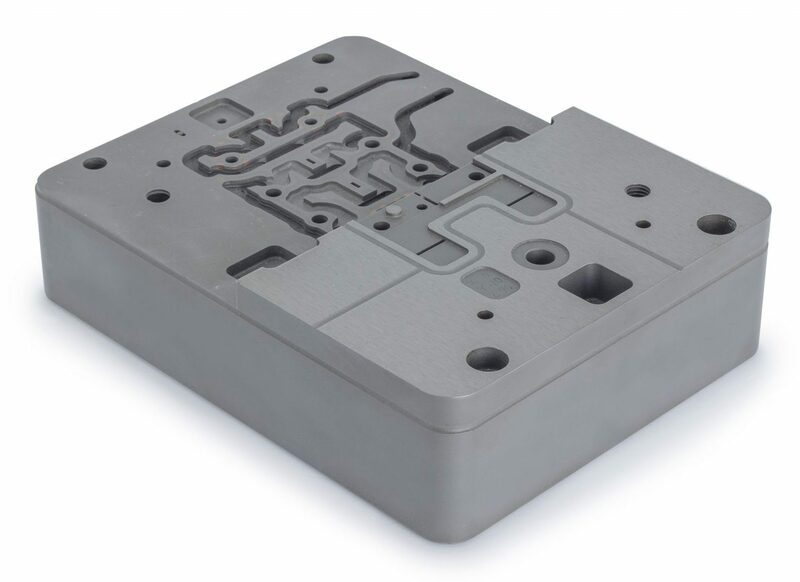 Conformal cooling channels also can increase the efficiency and cycle times of plastic injection molds. These cooling passageways follow the shape or profile of the mold core or cavity to perform a rapid uniform cooling process for injection and blow molding. There are also applications with liquid and gas dispensing equipment. In semiconductor and microelectronics fabrication, for example, sophisticated “showerhead” style gas distribution assemblies are used to dispense processing gases into a semiconductor etching and deposition chambers. These dispensing heads often have multiple, separate internal passageways. Given that traditional CNC cutting tools cannot be used for this purpose, one alternative already in use for items such as the showerhead assemblies is a similar additive process that varies in how it joins the layers: with brazing material. Brazing is a metal-joining process in which two or more metal items are joined together by melting and flowing a filler metal into the joint. The filler metal flows into the gap between the layers through capillary action. Although brazing has the ability to join similar or dissimilar metals with considerable strength, it also has significant drawbacks when internal passageways are involved. Brazing can cause small “fillets” to form in the passageways that obstruct flow and can even break off during use. Too little brazing material can create voids where liquid or gas accumulates and corrosion sets in, particularly in the presence of harsh chemicals like those used in the semiconductor industry. Diffusion bonding, on the other hand, creates a superior bond without the need of any type of filler material. In the diffusion bonding process, high temperature and pressure are applied to similar or dissimilar metals in a hot press, causing the atoms on solid metallic surfaces to intersperse and bond. Unlike traditional brazing techniques, the resulting bond exhibits the strength and temperature-resistance of the base metals. For the atoms of two solid, metallic surfaces to intersperse they typically must be at approximately 50-70% of the absolute melting temperature of the materials. To achieve these temperatures, the surfaces are heated either in a furnace or by electrical resistance to temperatures as high as 1400˚C. Conformal cooling channels also can increase the efficiency and cycle times of plastic injection molds. For many years, this technique has been used to join high strength and refractory metals that are either difficult or impossible to weld by other means. However, it was only through recent improvements in diffusion bonding presses that this new process has become even more attractive. This includes improvements to single cylinder hydraulic presses that required fixtures to apply a consistent, measurable amount of force – a key factor in the process. Today, leading manufacturers such as PVA TePla of Corona, California, offer multi-cylinder systems with large pressing plates that can accommodate a variety of parts. The largest, the company’s MOV 853 HP can process parts as large as 900mm x 1250mm at a pressing force of 4,000 kN. By controlling each cylinder independently, companies like PVA TePla can provide a press that provides extremely consistent pressure across the entire surface. The MOV 853 comes with built-in pressure transducers along the bottom of the pressing plate that allow individual hydraulic cylinders to be adjusted to achieve superior pressure uniformity over large areas. In addition to selling the equipment, PVA TePla can create diffusion bonded parts using this technique through toll processing services offered by its parent company in Germany. According to Walt Roloson, R&D Engineering Manager at PVA TePla, one of the most appealing aspects of the process is its ability to not only create the internal structures, but also to join layers of dissimilar metals. In this regard, there is no restriction on materials since all tooling steels are available in bulk sheets. By improving cooling performance, melted resins can be injected at higher pressures to significantly increases cycle times as much as 40% while enhancing product quality. Once the layers are bonded together by diffusion bonding, Roloson says traditional machining techniques can then be used to create the final external shape. “Due to the molecular bonding of the layers, the final part often shows no interface lines or striations. The interface of one material is actually blended into the other one, and vice versa, even with dissimilar materials,” says Roloson. PVA TePla is one of the world’s leading system engineering companies. Its core competencies are in the fields of systems for hard-metal sintering and crystal growing as well as the use of plasma systems for surface activation, functionalization, coating, ultra-fine cleaning and etching.